As of iOS 8, apps can deploy associated widgets to the Today screen in the iOS Notification Center. This tutorial covers how to build a custom widget that embeds a Message Center A place in your app where you can display persistent rich messages, including HTML, video, etc. Similar to email, Message Center represents both the medium (the in-app inbox) and the message type (the messages you send to a message center). in the user's Today screen. Use cases for this may include apps that either don’t need or can’t include a Message Center in their own UI, as well as the desire to allow users to check for new messages without needing to launch the parent application. As mentioned above, widgets are only supported on iOS 8 and above. Also be aware that as a new iOS feature, widgets may still be somewhat buggy. We recommend experimenting with these features early to become acquainted with them before deciding whether to integrate them into a production app. Widgets are not portions of the same app, but rather, separate processes that, together with the host application, form an app group, or container. In order for these processes to communicate with one another, the parent app and the widget must share data through this container. One of the most straightforward ways of doing this is through a special instance of NSUserDefaults that is shared between processes in the app group. When the parent app decides it is time to share new information with the widget, it can store data under a shared key in the user defaults, and notify the widget by calling the setHasContent method on the NCWidgetController class. When the widget is later displayed, the OS will notify the widget that it should update its display, by calling the widgetPerformUpdateWithCompletionHandler method, which is part of the NCWidgetProvidingProtocol. For the purposes of this example, we will be sharing arrays of message data serialized in NSDictionary objects between the host app and the widget. We will also show how to update the widget’s contents in response to a background push notification, so that the widget can remain up-to-date even when the parent application is not being displayed. Conceptually, it's important to keep in mind that in this arrangement, the host application bears all responsibility for notifying the widget of updated content. The host application, by virtue of the Airship SDK, maintains the local database of Message Center messages, and periodically fetches new messages from the server, either when the app is initially foregrounded or in response to a push notification associated with new Message Center content. In other words, the widget will only ever update its contents when the host app knows that there is new content. Because of this limitation, it's a good idea to add background notification support to your app, and to send new messages out with push notifications featuring the content-available flag, which will cause iOS to allow the host app to handle the notification event while it is in the background, and in turn will allow the host app to update the widget. This way, you can ensure users will see as up-to-date a listing of messages as possible when they enter the Today screen. See iOS Overrides for information about using the content-available flag in the API. In the dashboard, enable Background Processing to use the content-available flag. See: Optional Delivery Features: Background Processing. 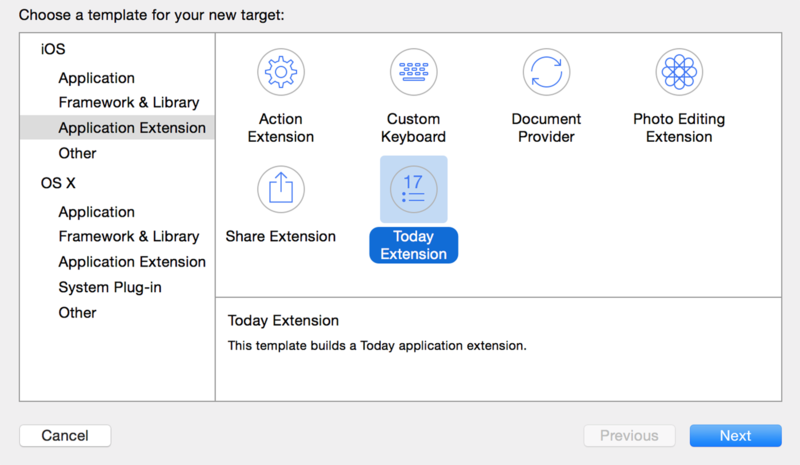 Choose an appropriate name for your widget, and under the Embed in Application section, select your main app's target if it is not already selected, and proceed. This should add a new extension to your project's source tree, along with a "Hello World" storyboard file and a TodayViewController class. We'll return to these later. The app identifiers for both the parent app and the widget must also have app groups enabled under Application Services. Click the Edit button and add App Group for each identifier, and ensure they they light up green before proceeding. The app delegate will be responsible for sharing messages with the widget when the UAInboxMessageList is updated, as well as fetching new messages in response to a background push. It will also handle deep links opened from the widget, so that message titles tapped in the widget will open the corresponding message view in the parent app. The shareInboxMessages method referenced in the above snippet will copy the current message list to the group user defaults, and notify the widget that there is new content. Be aware that where you see placeholders such as MY_GROUP_IDENTIFIER, you must provide the appropriate identifier for your app group. An incorrect identifier will cause data sharing across NSUserDefaults to silently fail. In order to provide a more consistent user experience, we’ll also want to retrieve messages whenever a background notification comes in. This will give the parent app a chance to retrieve new messages over the network, and share the results with the widget. We’ll do the same whenever the app transitions into the background, as well. Any new Today Extension should include a TodayViewController by default. A common approach to displaying a Message Center is to list message titles in a table view, although other designs are possible. Covering the specific design and display of the widget is beyond the scope of this document, however, and thus left to the discretion of the reader. // Deep link scheme, e.g. "vnd.mycompany.myapp"
When designing a Message Center widget, it is probably desirable to allow users to tap messages in the widget in order to open them in the host app for viewing. Because the widget and host app are separate processes, this cannot be done directly, but can be achieved indirectly through deep linking.